This letter is a few days late because Friday (your actual 21 month birthday) we left you with Grammie and Grandaddy so your daddy and I could go out of town for the weekend. We had fun, but missed you like crazy. You had some rough moments, but also had a ton of fun playing with your grandparents and Aunt Rebecca and swimming for the first time this summer! They said you kept putting your face in the water trying to “eat” it, but obviously weren’t too happy with the result of that! Last weekend, we celebrated Fathers Day. You are crazy about your Daddy and love him so much. I love watching him make you laugh and the special bond my two boys have. Since I haven’t done your “stats” in a few months, here they are. You weigh about 23 pounds and are 32 inches long. You wear size 4 diapers and still mostly 18 month clothes, but you wear 24 month pajamas and onesies. You have a gazillion teeth, a million of which came in this past month- oy. Your mouth full of teeth makes you look like such a big boy; in fact there isn’t much baby left in you. You still adore Veggie Tales and hate getting dressed and undressed. You still refuse to actually eat food, but are willing to taste almost anything. We discovered this month that you love the taste of pickles, of all things. You really are your Daddy’s boy. You are still tube fed continuously at night, but are down to 3 hour and a half feeds during the day. It’s nice to have hours during the day not attached to that pole! 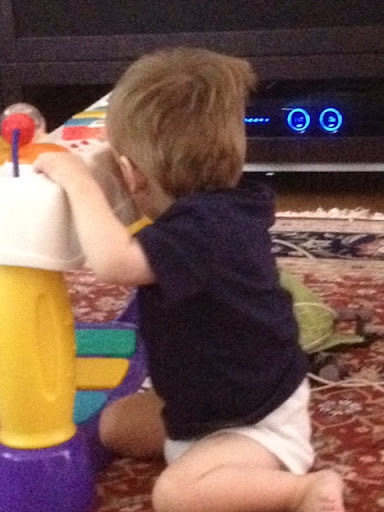 You are still working so hard on your motor skills and every day get closer and closer to crawling. you love to pull yourself up on your knees and explore the best you can. It’s amazing to watch your determination, which really is half the battle, right? 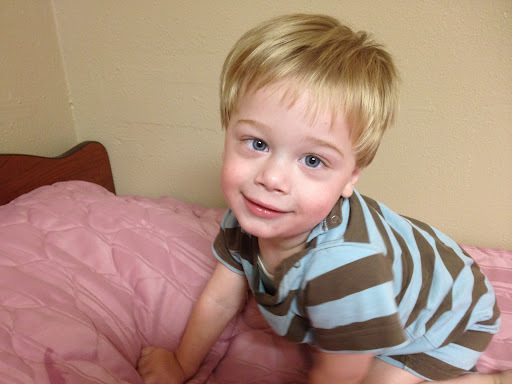 I love you so much sweet boy and am so thankful every day that God chose your Daddy and me to be your parents. Today our PT and a rep from a wheelchair/medical equipment company came to the house and we ordered Grayson his wheelchair and bath chair. 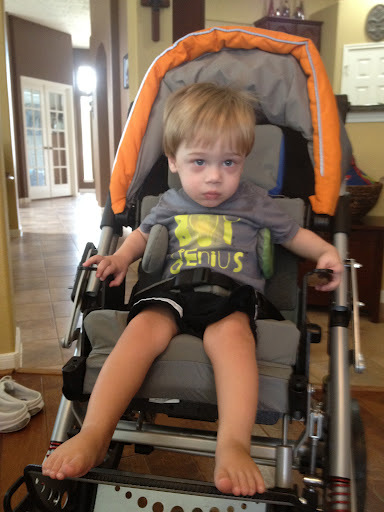 Any sadness I had about ordering a wheelchair for my child was gone when I saw how comfortable he was in the chair. He sat happily for about 30 minutes. And the wheelchair is really, well, awesome. 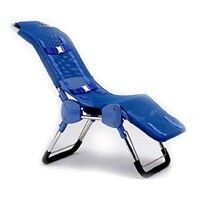 It has tons of adjustments, can tilt and recline and will come with a tray. 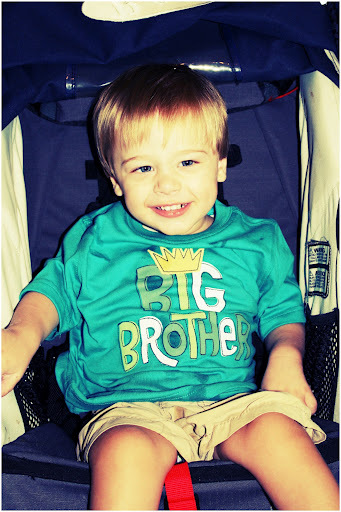 And look how great Grayson looks in it (his will be blue where you see the other colors). There is (of course) a lot of paperwork and approvals that have to happen, so we won’t get the chair for a few months- hopefully we’ll have it in time for the first day of school! This is the bath chair we will be getting. I am SO EXCITED about this. 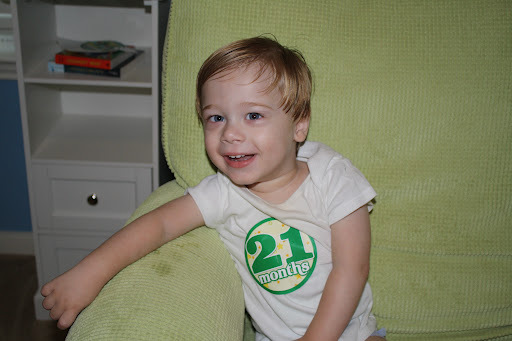 Grayson is 22 months old tomorrow, and I think it’s time he graduated from the Fisher Price Rainforest infant tub! And just for fun, one more picture- sweet little angel had cried and cried at naptime today, but finally fell asleep in my arms. 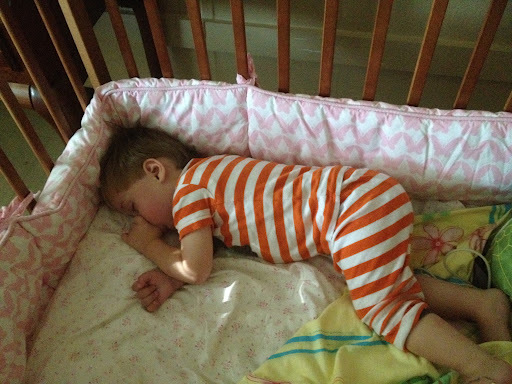 Thankfully, I was able to make the transition to his crib. He was just too sweet not to take a pic. I also got a call today that we will have a nurse for Grayson at the house starting Monday. I know it will be kind of awkward/strange at first, but I’m excited for the help! We got up early (5 am- ugh) this morning because Grayson was supposed to be sleep deprived for his ABR. 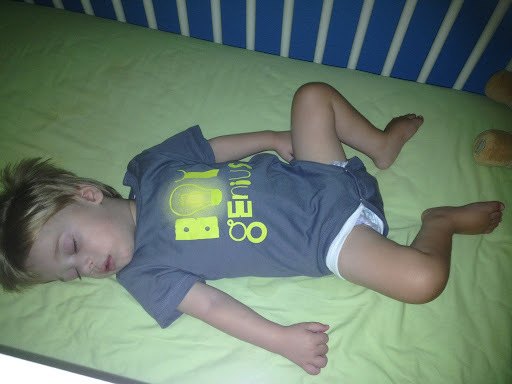 I was dreading the appointment because I knew getting G into “natural sleep” for the test was going to be a challenge. I had to give him his seizure meds at 9 am, so I gave him some Melatonin (a natural sleep aid) too. It worked- after about 10 minutes of hard-core crying while I rocked him and sang “Jesus Loves Me” he finally fell asleep with the sensors in his ears and on his head. The test only took 20 or 30 minutes and guess what it showed? Completely NORMAL hearing, in both ears. While I am THRILLED with these results (NO hearing aids- hooray! ), I’m also confused and ticked off at the audiologist who spoke to us after his first ABR, while he was still under anesthesia (he had it done during his muscle biopsy and G-button placement). She told us he had “moderate to severe” loss in his left ear, but neither the report nor any subsequent hearing tests has shown that. Just makes me wonder. In this journey, honestly, sometimes getting “normal” results isn’t a good thing. When you know something is wrong, you just want the labs and reports to tell you WHY. But in this case, normal hearing is the best news we could have hoped for- one worry we can now cross off our list. 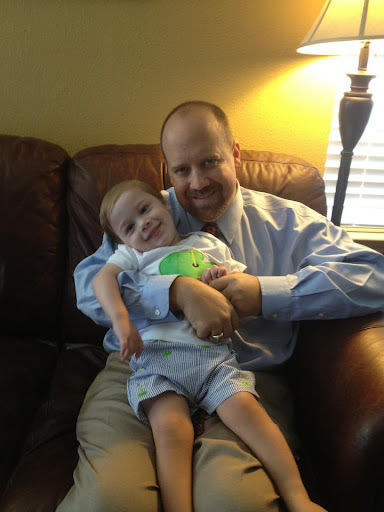 We got some very good news this week- I had the Mito clinic fax all of Grayson’s test results to our neurologist, and I requested a copy of them. We haven’t discussed the results with a doctor yet (we will with the neuro in two weeks) but from just reading over them, I don’t see anything immensely horrible or life threatening. There are some abnormalities on the MRI report and some levels of things I can’t pronounce that are low on the spinal tap report, but that’s probably just par for the course with Mito. We should get the results of our genetic testing back around next Friday (it’s been a loooong 15 weeks of waiting) and hopefully that should give us a more complete picture of what we are dealing with. I’m not getting my hopes up too high since there’s a chance the test could give us no information. We also finally talked to our MDCP case manager (after a million voicemails and emails that weren’t acknowledged) and she thinks we will be able to get about 39 hours of respite each week. Of course, I probably won’t use that many, especially since he’ll be in school 3 days/week next year- I would like to actually see my kid at some point- ha. But it will be SO NICE to be able to go grocery shopping, run errands, and even maybe take a nap during the week. Ryan and I are also discussing using some of our hours Sunday mornings so we don’t have to take Grayson to church. The last few Sundays he has not done well in the nursery- we think he may have had a seizure. He’s always done great in the nursery, but maybe he’s just too overstimulated and it’s too much to leave him there for almost 3 hours. We had OT and PT today- our PT is getting us hooked up with the companies that we will order his bath chair, wheel chair and AFOs. And his Medicaid number is working! I think because the whole process of getting on MDCP and Medicaid was so long and difficult that I still am skeptical that we actually will be getting these benefits. But we are, and I am so grateful. Hearing aid update: this hearing aid thing is driving me crazy. Our AI teacher hooked us up with the center that can make the mold and hopefully program the aid that our sweet friend is letting us borrow. Well, their audiologist reviewed the ENT’s notes and G’s ABR and isn’t convinced he is a candidate for an aid. Ok…SO, we are going to have YET ANOTHER hearing test next Tuesday morning and attempt another ABR (measures the brain’s response to sound). I say attempt because I refuse to sedate Grayson unless it’s absolutely necessary, so we are going to try to get him to fall asleep and test him that way. I’m skeptical. Honestly, I’m hoping the ABR and booth test both come back normal. I really, really don’t want to have to mess with a hearing aid if we don’t have to. I am feeling really overwhelmed with all of Grayson’s medical devices and “equipment” right now, so less is more the way I look at it. So we’ll see. Today is Ryan’s and my 4th anniversary. We were going to go to dinner, but couldn’t get a babysitter early enough for us lame people that have to be in bed by 9- ha! So he is picking up Chinese food that we can eat in our pjs, which honestly sounds divine. Life was a tad more glamorous four years ago. Sigh. Once again, I’ve been a bad blogger this week and even worse commenter. I’m sorry. We’ve been busy with Grayson’s ever-packed schedule as well as going through some things I’m not ready to talk about right now. But we are fine, and I’m happy to say I am showered and in my jammies at 7:16 on a Friday night. Such a wild life I lead. The nursing home stay on Monday was, well, fine. It took us 2.5 hours to get there and the place was a dump. The whole time I was just feeling so sorry for the people who have to live there full time. We were only there 13 hours and got out as fast as we could. We were technically allowed to leave at 12:01 am, but Grayson was sound asleep at midnight so we just decided to let him sleep until he woke up. He woke up vomiting in the crib at 4:30 (typical for him) so we packed up at were home by 7:30. Not something I want to do again, but the benefits will be well worth it! His very own tiny pink crib- ha! Tuesday afternoon, we saw a new doctor- a doctor of physical medicine. She was looking at Grayson’s development, delays, and muscle tone. Nothing earth shattering- we discussed his stiffness, and she said he might need muscle relaxers at some point, but not now. She wants him in his stander every day as well as for us to do stretches of his legs. She wrote a prescription for AFOs (custom orthotics for his feet), a bath chair, and a wheelchair. 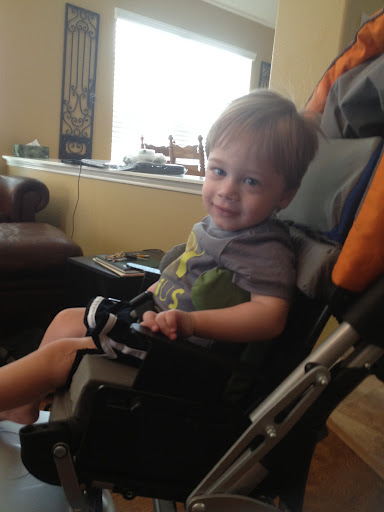 I can’t believe we’ll be ordering a wheelchair for our kid, but it will be a good thing, especially with him going to school next year. I am VERY excited about getting him a bathchair- since he can’t sit up on his own, we are still bathing him in the infant tub, on the counter. It’s a mess. Yesterday, we schlepped down to the Med Center for a 10 AM opthamology appointment. We arrived at 9:45 per the request of the office. At 11:15 we still hadn’t been seen. Grayson was tired and cranky, and Ryan and I were tired and cranky. I made Ryan ask how much longer and the doctor still had 2 patients ahead of us! I was done. We left. I am so annoyed by the whole thing that I am seriously considering changing doctors. I just don’t understand such a lack of respect for people’s time, especially when they know we are waiting with young children. Ugh. Another reason we left the doctor, other than being supremely annoyed, was we had an appointment with our attorney to sign the papers for our will and Grayson’s special needs trust. We are so grateful to have this taken care of and that we have measures in place so that G will be taken care of the rest of his life. Today we didn’t do much- we spent the afternoon at my parents’ house and my mom and my sister entertained G so I could get some rest- such a treat! I work this weekend so my boys will be on their own- will be interesting to see what adventures they have- ha! I took a little blogging hiatus last week, not for lack of things going on, but I just didn’t have the drive to sit down and write. We are doing fine-here’s what’s going on in our world. 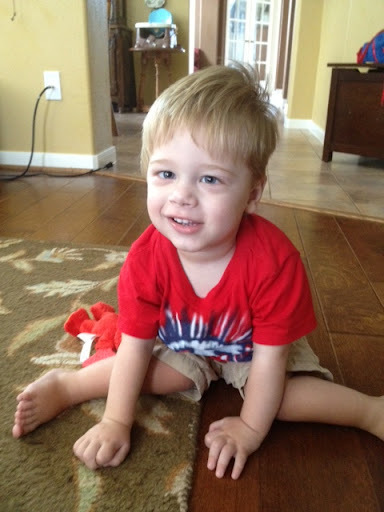 We are taking our first summer “roadtrip” tomorrow for Grayson’s nursing home visit. If you remember, nothing about this process of qualifying for MDCP has gone smoothly, so why would I think this last part would either? I emailed our contact at the nursing home Friday afternoon to confirm and the email bounced back to me- twice. Hmm. So I called the nursing home and asked to speak to her. Guess what? She no longer works there. WHAT?! So I have no idea if our “reservation” is on the books or not. And of course I called at 5:00 on Friday and the administrator had gone home. So praying tomorrow morning when I call that everything is set. I’m ready to get this over with! We saw the pulmonologist on Friday and got results of the sleep study. It was good news. Grayson did have 18 apnea episodes throughout the night, which seems high to me, but the doctor assured me they were minor and there is no need for interventions right now. Thank goodness. She did put him on a daily inhaler to improve his respiratory symptoms. We got an email and later a phone call that our Mito specialist has been put on bedrest for her pregnancy and we won’t be able to see her for our appointment in July. We need to email her nurse to coordinate how we are going to get the results of Grayson’s MRI and spinal tap. I’m a little stressed about this. This week, we have our nursing home visit, 2 doctors appointments (opthamologist and physical medicine), 3 therapies, 1 playdate, we are signing the paperwork for our will and trust we’ve set up for Grayson, and my sister comes home from college. We’ll be busy!